Also remember to check out the Multigrab cable drum handler concept. ISO shipping container on a Jack-Pack hoolift skeleton frame hauled by a Humvee in a battle situation. Could be used both as a shelter and for supply purposes. The front axel rubber wheel set is pendeling at the same principles used on tractors. Here is an image of the latest version with rubber wheels. The rear wheel set is pendeling as well. A hook lift skeleton frame with a Jack-Pack® unit attached could be moved with ease. Our latest version is designed for Ø 500 mm diameter compact rubber wheels that supports 5400 kgs each, that means a total weight for the skeleton frame that reaches almost 22 metric tons. Maximum speed 25 km/h. It's not for highway use. These skeleton frames are made for moving 20‘ ISO containers with the benefit from the quick loading and unloading that the hook lift truck gives. 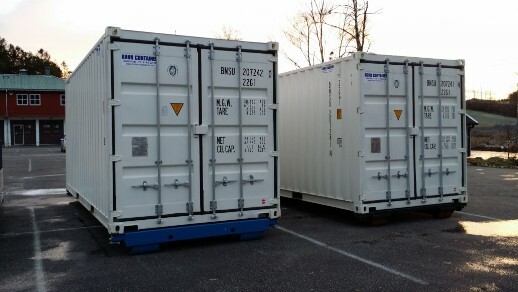 20’ ISO container are among the most produced containers in the world today with approx. 17 million units built (according to Wikipedia). When the hook loader unloads such frames at a site it will more or less be stuck at the position where it is left off, but that will not be a problem if it's equipped with a Jack-Pack unit. Imagine this skeleton frame equipped with a Jack-Pack® unit. This will make it possible to move it around with ease, for example into very tight spaces due to the superb maneuverability the Jack-Pack unit provide with its 180 degree turn angle. It could be moved into areas with low ceiling high where no crane could place them, moved around tight corners, into small door and tunnel openings due to the fact that when it is mounted on a hook lift skeleton frame it is moved lengthwise instead of across like a 20’ ISO container naturally does when moved by a fork lift. 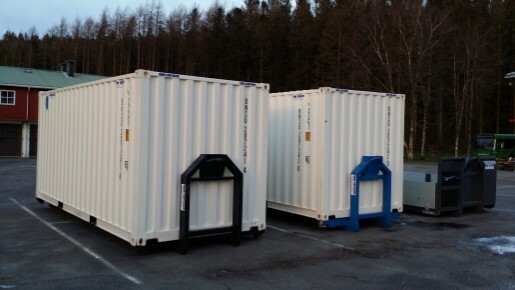 There already exists products on the market that are specially designed to move 20 'ISO shipping containers internally on a site. However, they require a fairly great deal of mounting work before the container is ready to be moved. And there is a lot more of such solutions to watch on Youtube. A hook lift skeleton frame with a Jack-Pack unit provides you with the benefit that when the hook loader unloads it at a site it's ready to be hauled at once. The fact that the Jack-Pack unit can stay attached to the container on a permanent basis means that the container can be delivered to the worksite ready to roll. No mountings to be done at the site at all. Just unload the container from the truck and hook the towbar on to a vehicle with a towing hook and off you go. Jack-Pack® will make the hook lift system in general more and more profitable and popular. If your worksite is an airport or some similar big open areas you can make it a train and haul a number of containers in a row. The possibilities are endless. Below is a short demo that shows the difference between the cornercasters on the market today and the hook lift solution. As you can see the existing casters makes the container behave like shopping cart with no adaption to uneven surfaces. The hook lift solution adapts to uneven terrain without problems. Today's corner casters makes the container behave like a shopping cart and hence they are unsuited for uneven surfaces as you can see from this animation. Also because of the way they are swiveling they could easily shred the pavement apart and cause expensive repairs. Our solution fits perfectly for uneven surfaces, which competing solutions do not. You can clearly see one of the problems with the fixed corner casters on the container in the middle of this animation. One wheel is way up in the air, and this will always be the case with this excisting solution when the surface is uneven. The hook lift solution make sure that all 4 wheels will be in contact with the surface at all times. The container fits to the hook loader with or without Jack-Pack.